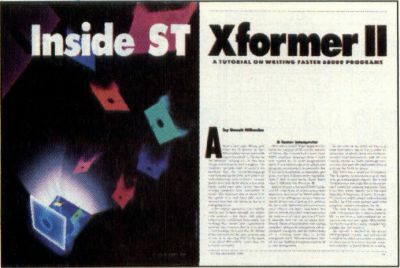 I have read the article "Inside the ST XFormer II" (December 1988) and have tried to connect my ST to my 800XL through the modem. Iam having difficulty in making the connection. I cannot seem to make the 800XL answer. (I am using XE-Term.) How do I go about transferring files from the 8-bit to the ST? We suspect you're having problems because you're not using a "null modem" cable. A null-modem cable is specially wired for transferring files directly between computers. Your first step in this process, then, is to run down to your local Atari dealer and purchase one of these cables. Once you have the null-modem cable, it should be connected between the RS-232 ports of your ST and 800XL. You must then run a telecommunications program on each of the machines, making one of them the sender and one the receiver. It's important that you have both telecommunications programs configured the same; that is, they should both be set to the same baud rate, be using the same transfer protocol, etc. When you've got everything set up as above, all you have to do is send the file to the computer waiting to receive it. We would suggest that, even though you have a direct connection between the computers, that you use a transfer protocol that incorporates error-checking. X-Modem works great.